If you want a pup out of a specific pair put down a deposit early, as most of our litters are sold before they are born. Remember - ALL of our litters are born in a family environment, one litter per family. None of our dogs live in kennels. You can find pictures of all these dogs on our Dog Family and Photo Gallery pages. There are already folks on all lists so reserve early. If you want puppy training be sure to reserve that VERY early - we only train two pups per litter and get booked up fast. ALL shipped pups must be crate trained this year and as of now we are not doing any shipping except for very rarely, non stop flights. All pups are $3000. Deposits are not refundable. You'll see a huge difference in our pups compared to most! Good genetics and well trained folks who devote themselves to producing excellent quality GSD is our forte. Vets and trainers across the U.S. constantly tell us; your pups are the best we've seen. Look for pups from Lola and Argus. Proven to make fantastic pups together! They produce the best of all worlds, their pups will work or be family dogs equally well. Everyone loves their pups from these two! Pup DOB was April. all reserved. Zoi, a Moonshine/ Joshua daughter, will be bred to our OFA excellent stud dog Argus. 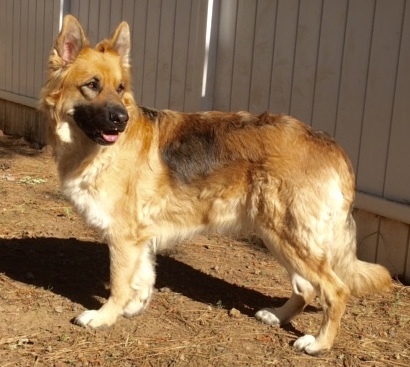 Zoi is a fun, healthy, playful girl. She has passed her health tests and has good hips. Her dad Joshua is our PTSD service dog who produces excellent pups, especially with Zoi's mom Moonshine. We will get exotic colors and great temperament. ​ Whiskey is our Jamison/ Mija daughter. Both parents have excellent hip and health tests done. Whiskey's sister Surf is a Search and Rescue dog. Lots of talent here. Whiskey is bred to our Karma/Bacchus son Zak, who is plush and gorgeous! Fall/winter litters expected from Moonshine and Lola. That will be Moonshine's last litter and possibly Lola's too, so if you love those girls reserve early! Note: our dogs live with families in CA and Oregon. NO dogs live in kennels. We do not sell to breeders. Every dog in our breeding program is a dearly loved family member.